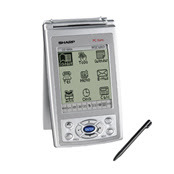 I got a new organiser and it really goin 2 make life comfortable.Get organized quickly and affordably with the Sharp OZ-590A electronic organizer. Maintain all of your names, phone numbers, appointments, and events in this pocket-size yet powerful unit. stores thousands of personal entries. with included CD-ROM software and USB PC-Link cable. allows for approximately 24,000 English/Spanish word translations. allow for easy lookup of thousands of addresses and phone numbers. allows you to keep track of all your appointments. helps protect your display from scratches and other damage. lets you check the spelling of approximately 12,000 words. Battery Life -Approx. 120 hrs. when data is continuously displayed without Backlight. -Approx. 60 hrs. when data is searched for 5 min. and displayed for 55 min. per hourly use and Backlight is on for 2 min. per hourly use. -Approx. 1 yr. when turned off and the clock is running.